On that day, a few years ago, the Sunday School kids each were each looking down at a piece of watercolor paper. They each had a supply of pastels and crayons and watercolor paints at their ready and a plastic cup of water for rinsing their brushes. I had expected this to be the best Sunday School class ever! We’d be talking about the beauty of God’s creation and doing art! Kids love art projects, right? When I was a kid, my art supplies were my toys. I played around with crayons and paints and clay and charcoal in relaxed, creative playtime. Family members offered occasional guidance and loose instruction, but mostly encouraged exploration and fun. So that day, I figured we’d have fun with art. I was excited to share the technique of crayon resistance paintings using watercolors. I spent a minute explaining how it worked. With resistance painting, you draw with a wax crayon or a pastel, and then you paint right on top of your drawing. The background will soak up the paint, but your drawing will be unchanged and will shine right through. “So go for it!,” I told them and picked up a crayon. I looked around expecting hands to be grabbing at crayons, eager to start. Instead, every hand was beneath the table….not a hand in sight. So I gave them some ideas…..like a bunch of white crayon stars painted over with a black night sky, or brightly colored fish painted over with a blue sea. I told the kids that they could draw flowers and then paint on the green meadow, or they could draw and color in clouds and then add a blue sky. “But what should we draw?” another young boy asked, after I finished talking. “I don’t know what to draw,” a girl chimed in. “No, you don’t all have to draw the same thing.” I said. Looking around, I noticed that all of their small hands were still tucked neatly under the table. “If you want, maybe try one of the ideas I just shared.” I gave my fish two fins and an eye. And then, one of the preteen girls said the one thing that should never be said about art. Scared? What the heck was going on? How in the world could a kid use that word to describe a little light-hearted painting? I wondered if this could be a symptom of the times….a symptom of this electronic age when kids rely on YouTube and the internet for easy and quick entertainment. A generation ago, a kid who wanted to stay entertained needed to exert effort. Back then, kids had to look around for activities to keep busy and often had to step outside of their comfort zone and be challenged. So even when those kids had no interest in jumping into something new, they did it. Cause when they had to choose between trying something new and just staring at a wall, something different seemed a bit more attractive. When I was a kid, if given the choice between playing Connect Four with a friend and a frenetic outside game of Kick-The-Can with ten to twenty of the rowdy neighborhood kids , I would have chosen the inside game 100% of the time. But when choosing between Kick-The-Can/Lord of the Flies chaos and just sitting in the house watching the Dinah Shore show with my mom, I tightened up my bobo sneakers and headed outside. I was pushed outside of my comfort zone again and again when the alternative was boredom. I drew, I painted, I learned to crochet, I played jail break, I learned to double dutch, I played box ball, I played lawn darts, and I made houses from playing cards. But keeping a child engaged and occupied these days is easier than it was back then. In my youth, a parent kept a restless or cranky child quiet in a busy restaurant with paper and crayons, legos or playdoh. But nowadays, even the youngest child is simply handed a cell phone and is instantly quieted. So I guessed that art as free play was a little foreign to my Sunday School kids. Fortunately, we got through the crayon resistance project. To my relief, the kids felt better when I suggested drawing puffy words, like Love and Peace, or even their own name. With encouragement, they all drew and painted and they seemed proud of their work. Moving forward, I would like to see Sunday School classes that includes more art projects. I would like to see elementary school art classes encourage free expression. I would like decoupage, paper mache, pastels, and water color to be common childhood activities. And I would like small children that are bored to be handed a crayon instead of a cell phone. Maybe I can gather those Sunday School kids for a Jackson Pollock project some time soon. If those kids thought that the water colors were scary, wait til I encourage them to start throwing paint! This entry was posted in Uncategorized and tagged art, art education, creativity, faith, family, home, inspiration, sunday school. Bookmark the permalink. I felt sad for those kids reading this. Being scared of a blank sheet and a selection of colors. Oh My! Having technology entertain our kids does take some of the exploration and effort out of playing. I also wonder if something else is going on here. Perhaps a fear of failure. Not doing it right. Not being perfect, if you will. With an abundance of youtube tutorials and Pinterest ideas which guide us step by step on how to achieve that perfect outcome, our kids today may not be learning that it is okay to be wrong. That we find our success thru the path of our failures. Having a blank page, a selection of colors, and no step by step instructions could seem very intimidating. 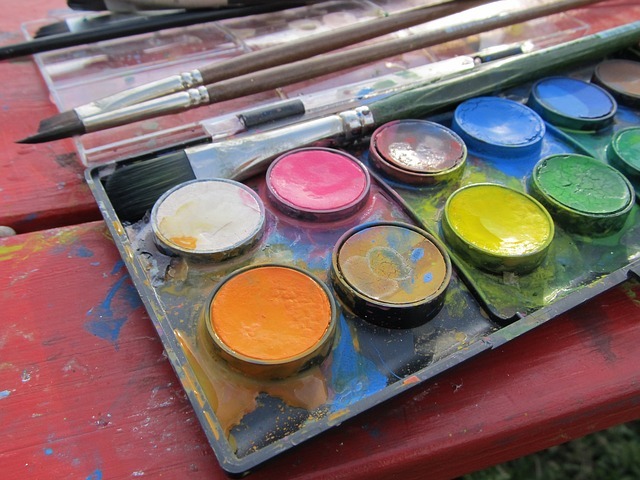 Art, play, and creativity should be a staple in every child’s life. The ability to explore. To be wrong. To use those colors that bring us joy. To find our personal success. Great Lisa, Good Luck with your Sunday School class in November.